A circular letter was received from the Local Government Board pointing out that the sugar supply was extremely limited, owing to the cutting off of supplies from the Continent, and suggesting that the Guardians should take into consideration the advisability of discontinuing the use of cube sugar in cases where granulated sugar could be used.—It was decided to advertise for granulated sugar in future contracts. Tea is not expected to become cheaper, in spite of heavy shipments of nearly 20,000,000lb from Ceylon and of 6,000,000lb from India. There has been a slight fall in the less expensive teas, but this, according to several of the largest retail houses in London, is nothing ; there was plenty of room for a drop, as market prices had advanced considerably, in addition to the rise caused by the increase in the tea duty in November last. It is stated that owing to various special circumstances such as the very greatly increased consumption in our own country and also in France and Russia, and the unprecedented requirements of the War Office for the supply of troops at home and abroad, enormous contracts for which are given out almost weekly, there has been an abnormal rise in market values. Common tea realizes about 1s per lb in bond and 1s 8d per lb duty paid. It is curious to note that while France is using more tea owing to its ease of preparation, in the United Kingdom the consumption of coffee has risen. This advance is stated to be due partly to the large number of Belgian refugees, who cannot be induced to drink tea, and also to the sale of coffee at many of the camps and in some of the public-houses after 10 o’clock. THYME AND MARJORAM FOR MAKING ANTISEPTICS. Mr B B Dickinson, 5 Barby Road, writes :—Thanks to the very generous response to the appeal for thyme and marjoram, the Rugby School Chemical Laboratory has now ample supplies. We beg to offer our grateful thanks to all those who have so bountifully helped us. The booklet, “ Why We Must Save, and How,” issued by the Parliamentary War Savings Committee, should certainly be read by all those who are anxious, following the advice of the Prime Minister, to do their part towards conserving and increasing the national resources. A good deal of the booklet is based on the articles already published in the Advertiser, but there is one very interesting and suggestive addition—a memorandum on “ Village War Food Societies,” drawn up by Mr H C Long, of the Board of Agriculture. The formation, it is suggested, might be brought about by clerks to parish councils, who might call a meeting of local residents interested in gardening, pigs, poultry, bees, &c, for the purpose of considering the formation of a local society. This being decided upon, a small committee should be elected (with chairman, secretary, and treasurer of the society) to organise the work of the society on a business footing. The object of each society would be to ascertain the position of vacant building plots, uncultivated “ waste ” areas, and possibly even of common land ; discover the owners, and secure permission to cultivate land (if possible without charge to the society) ; arrange either for co-operative and mutual cultivation of the land so secured, and ownership of the produce, or parcel it out to the members to cultivate for themselves individually ; secure manures, seeds, plants, stock, foodstuffs, and implements on a co-operative basis, and sell or preserve for home use the produce of their labours. In most villages, it is pointed out, there is sufficient expert knowledge available. Failing that, help may be obtained from the Board of Agriculture ; whilst leaflets, dealing with particular subjects, may be had free from the Board. It is recommended that a short, concise set of simple and plain rules should be drafted, based on whether the cultivation of the plots is to be individual or co-operative as regards produce. If the work were to be co-operative and mutual all through, the produce would be divided in proportion to the labour and interest of the individual. Actual cultivation might be individual ; but seeds, stock, &c, might still be supplied on a co-operative basis. After this general introduction the memorandum proceeds to consider the forms the activity of the societies might take. In each case, for full details reference is made to the leaflet issued by the Board of Agriculture, dealing with this particular subject. In rural districts there is usually scope for the keeping of goats, which may be housed and fed fairly cheaply, and, if care is used in their selection and treatment, will yield a good return in the form of wholesome milk for the owners. Co-operation among members of a village society may have excellent results in connection with goat keeping. In connection with many cottage gardens, and on the vacant areas it is proposed should be utilised, pig-keeping could be practised much more commonly than at present, and the society should endeavour to increase the local output of pigs. Pig-keeping could readily be conducted on a co-operative basis, and there would be large quantities of waste vegetable matter which would be of very great value for this purpose. Every additional egg and every extra chicken will help the food supply if produced under proper conditions, and there is at the present time special need to increase the numbers of both eggs laid and poultry reared. Any reduction in the laying or breeding stock of poultry kept is against the best interests of both the individual and the public, and the societies should do all they can to extend poultry keeping in their districts—again, either by individuals or collectively by co-operation. The number of persons who could readily keep poultry is very great, and a few birds kept by each would not only enable them to utilise much household and garden ” waste,” but to utilise it in the economic production of eggs and table birds. In some districts, where there are fairly large areas available, it may be possible to take up the co-operative rearing of turkeys. While it may often be desirable and profitable to sell the eggs produced when new-laid, the societies may usefully consider whether their members cannot act in concert, purchase jars and materials in bulk, and preserve eggs for future use. By this means it may be possible for a small district or village to put by some thousands of eggs during the “ cheap ” season for use when eggs are dear, and so save the meat bill. There is plenty of opportunity in every village for increasing the food supply by means of rabbit breeding. A further means of increasing production lies in the breeding of pigeons. Little equipment is necessary ; cotes and wire enclosures can be made by any man who is handy with tools. The birds need little attention if they can be allowed their freedom, and will rear several brace of youngsters annually. There is always a satisfactory outlet for good honey, which is a valuable article of food, and it should be especially welcome at a time when sugar is so dear. The Village War Food Society might very usefully endeavour to extend bee-keeping in the district. Apart from the fact that, so long as freedom from disease can be secured, the production of honey is an inexpensive and remunerative village industry when the honey is sold. Honey may, if retained for home use, effect a considerable saving in sugar. Co-operative bee-keeping would almost certainly be of value, and could be more economically and successfully conducted than individual work. Hives placed in separate gardens could still remain part of a co-operative plan, and the running, packing, and marketing of the honey could be done at one house and with one set of appliances, while the management of the hives could be more readily and effectively controlled. In normal years there is usually considerable waste of fruit throughout the country. Village War Food Societies should strive to ensure that all fruit in their district is properly utilised. When in season fruit will materially aid in reducing the meat bill, and is a wholesome, strength-giving food. Any fruit, however, which is not consumed fresh, or is not marketed, should be stored or preserved in some way for future use. Apples and pears may be stored in cool rooms, and soft fruit may be bottled or converted into jam or dried. . . . Members of societies might materially reduce individual costs of storing and preserving if they worked co-operatively, buying materials wholesale, bottling and preserving the members’ fruit in the same way. Another matter which the societies might well take in hand is the collection of wild fruits and their sale or preservation for home use. Blackberries, wild raspberries, cranberries, whortleberries, crab apples, and hazel nuts may all be collected in considerable quantity in different districts, and all add largely to the food resources of the collectors. Children should be induced to take up this branch of work, and the collected fruit may be sold, or bottled or converted into jam. It has not been sufficiently recognised that acorns, horse chestnuts, and beech mast are all useful foods for stock, especially acorns. The village societies will do well to do all that lies in their power to utilise these products to the full. They may readily and quickly be collected by children, and even when not required for the stock owned by members may, doubtless, be disposed of to neighbouring farmers. In all rural districts are to be found spots carrying considerable amounts of tough grass and green herbage, nettles, &c. General collection of such material may result in the ownership of a useful quantity of rough hay, which may be picked over by the goat, and used generally for the stock, either for food or litter. It may be possible to make it into silage with other greenstuff. Town or Urban War Food Societies might be formed on somewhat similar lines to the Village Food Societies referred to above, but their sphere of activity would probably be more restricted to gardening operations. Both types of societies should not only deal with increased production, but with the economic utilisation, preparation, and consumption of foods in each individual home. Lord Selborne’s announcement of a series of conferences with agriculturists in various parts of the country, with a view to increasing the production of foodstuffs during the war, has been generally welcomed. All the organisations interested in agriculture have been invited to send delegates. The meeting at Bristol will be on September 16th, not 15th, as at first announced. The first will take place at the House of Lords next Thursday. Private Clifford Earle Hitchcox was born in 1894 in Newbold-upon-Avon and was baptised at St. Botolph’s Church, Newbold-upon-Avon 22nd September 1895. His parents were Walter C. and Mary Ann Hitchcox. Walter Hitchcox was a Railway Guard and the family were living at 96 Abbey Street Rugby. Clifford was the 9th of 12 children. On the 1911 census he is given as working as an engineers clerk. His elder brother Edwin John had died of dysentery in the South African War. 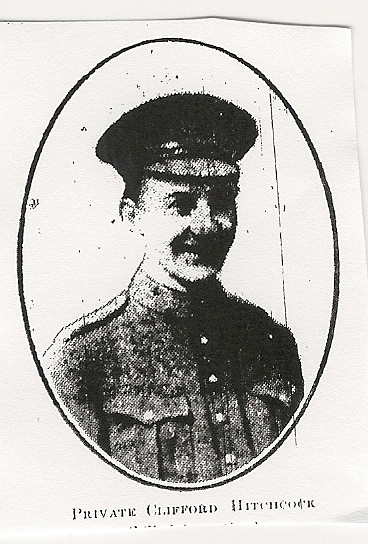 A cousin of Clifford’s, Private Frank Handley of the 1st Royal Warwicks had also recently been killed. Grave/Memorial Reference ll. B. 4. Private Bert Norman, full name Herbert Benjamin Norman, was born 1895 in Worcester, and he is always referred to as Bert. His parents were Herbert and Emily Norman. His father was an Iron Moulder and his mother is given as a Gloveress living at 4, Vincent Road, Worcester in 1901. Between 1901 and 1911 the family moved to Rugby and were now residing at 50 Abbey Street Rugby. Bert’s father was now working for the B.T.H. Works. Bert attended Eastlands Council School and became Captain of the school football team and subsequently captain of the Old Eastlands Boys’ Club. On leaving school he was apprenticed to the moulding at B.T.H.Works. He enlisted 25th August 1914 and was with the Oxford and Bucks Light Infantry. He was killed as a result of an explosion of a German mine. In a letter to his father Capt. A. Ponsonby explained the circumstances of how Bert had died. “It is with the greatest regret that I have to write and tell you that your son met his death in the explosion of a mine crater on the 25th, and was buried by a Church on England chaplain in a very nice cemetery, which contains the bodies of many soldiers who have died in the neighbourhood. He was the sentry on duty, when at about 4.30 in the morning, there was a sudden eruption of the ground, and a large portion on earth completely covered him, but owing to the altered formation of the ground he and two other men could not be found for a long time. In any case death was absolutely instantaneous owing to the great weight of earth that fell on him. I am so dreadfully sorry it should have happened to him, as we all looked upon him as an excellent young soldier and a most cheerful companion. Bert’s last letter home states that the front of the trench had been blown in – an incident that had made him feel rather nervous – and is evident he met his death a few days later by a similar mishap. He is buried in the Guards cemetery, Windy Corner, Cuinchy, France. August 25th 1915 the day he was killed was the anniversary of his enlistment, he was 20 years old. William Thomas Cockerill was born in 1879 in Hanley Staffordshire. It is not known what the family were doing in Staffordshire as the rest of the children were born in Hillmorton. Thomas’s father Walter, a plasterer, married Martha Brown at Hillmorton Parish Church on 28th June 1875. Martha died the following year and Walter married Elizabeth Goode in 1877. By 1881 the family lived in Upper Street, Hillmorton. Walter died in 1884 at the age of 35 and in 1890 Elizabeth had married Edward King. By 1891 the family were living at 19 Plowman Street, Rugby and by 1901 they had moved to Gas Street, Rugby. Thomas was educated at St Matthews School and worked as a bricklayer’s labourer in Rugby. By 1901 he had left home and joined the 1st Kings Own Yorkshire Light Infantry. He served in the Boer War, receiving two medals. After leaving the army, he remained in the reserves. He settled in Sheffield, where he married Nellie Pearson in 1906 and by 1911 was working as a labourer for an armour plate manufacturer (Vickers Ltd). He and Nellie had two children, Walter and Lewis. A third child was born later. When WW1 started Thomas was called up (private, no. 6039, 1st Bn, KOYNI) and in November 1914 he was wounded. He came home, but on recovery returned to the front. 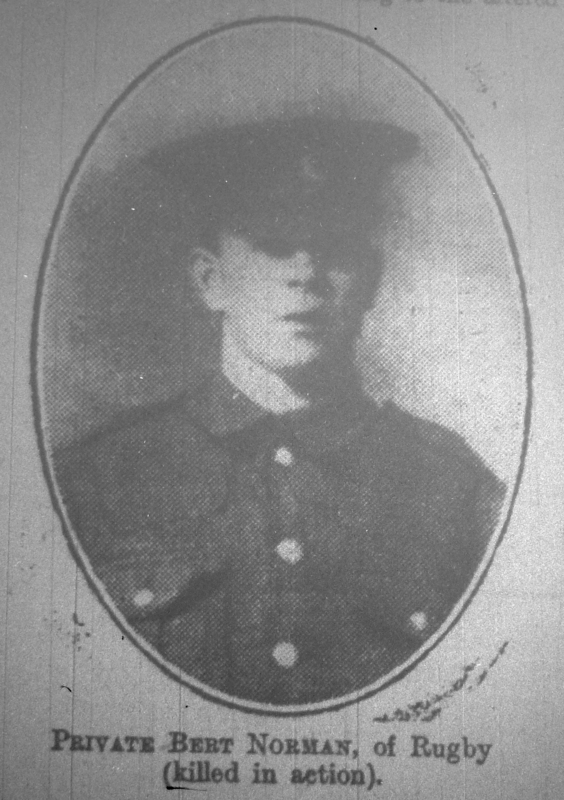 On 25th August 1915 he died from wounds caused by the bursting of a shell. He was buried at Etaples Military Cemetery. Thomas William Forehead was born 13 April 1890 at Leicester. His parents were Thomas and Julia Forehead and 1891 and on the 1891 census were dwelling at St. George Street, Leicester with his grandmother, Mary Satchell, a widow, both Thomas’s parents were in the shoe industry. His father was a shoe machinist and his mother was a shoe clicker. On the 1901 census, they are still in Leicester but residing at 84, St Andrews Street Leicester. By 1911, Thomas is in Rugby working as a hairdresser and is lodging with John Cave, a hairdresser, and his wife Agnes at 148 Railway Terrace, Rugby. Thomas married Lydia Maria Dobson in 1913 and a daughter, Winifred Dora Adelaide, was born in November 1913. At that time they were living at 150 Railway Terrace, Rugby. Thomas’s wife Lydia became Mrs. Patrick Farrell in 1918. George Henry Osborn was born in the last months of 1892, he was baptised 11th January 1893 at Holy Trinity Church Rugby and the family were residing in Wood Street Rugby. His parents were Reuben and Mary Ann Osborn. He was the eldest of two children. His sister Alice May was 2 years younger. According to census the family were living at 47, Cambridge Street, Rugby in 1901 and in 1911 were living in Windsor Street Number 31. George Henry had been an engine cleaner in 1911 then a fireman working for the L. & N. W. Railway station four years, and had been employed by Willans & Robinson for 3 years when he enlisted. 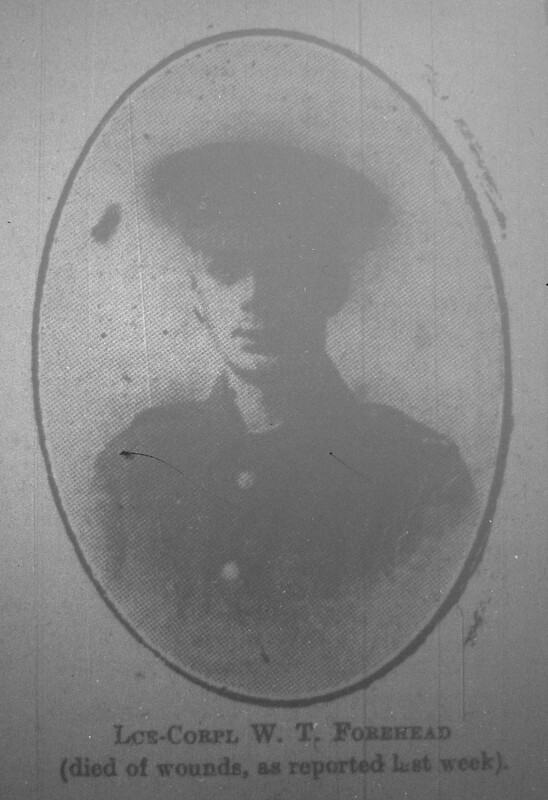 George Henry served with the Royal Field Artillery, 92nd Battalion, 17th Brigade, 29th Division as a gunner and died of dysentery in the Dardanelles. 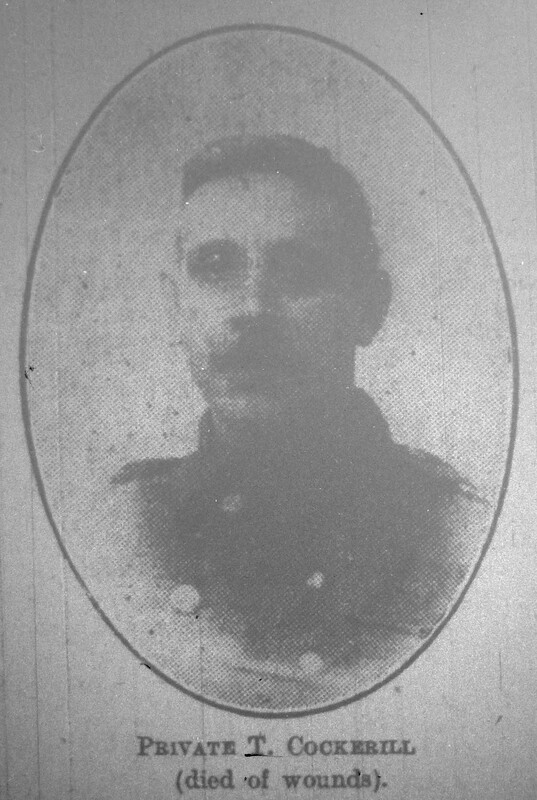 A brief entry was given of his death in the Rugby Advertiser 18th September 1915 and a fuller obituary was written in the following week’s Rugby Advertiser dated 25th September 1915. At the time of his death George was 23 years of age and unmarried. He had attended Murray School and was an excellent footballer. He was a member of the earliest teams to win the Elementary Schools’ Rugby Shield and he played for Rugby 2nd XV which was one of the successful teams in the Midland Junior Cup Competition. 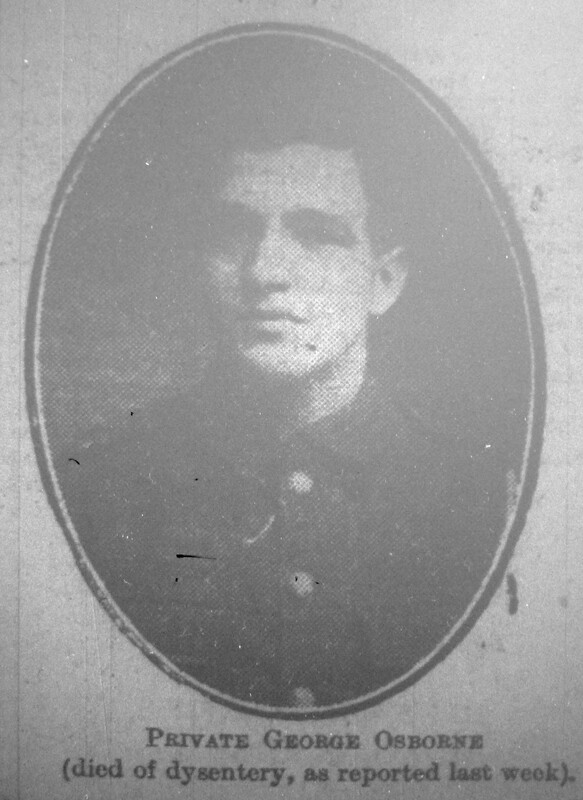 George Henry Osborne enlisted in Rugby and was a Gunner, Service Number 11034. He died of dysentery 21 August 1915 and he is buried in East Mudros Military Cemetery, Greece. Grave/Memorial Reference ll. K. 183.